Appointment Training is designed to meet the specific needs of the player or team. Appointments include: individual training, 2 person training, small group training and team training. Your training session will begin at the assigned time. The session does not begin once the player arrives and is ready to start. The session begins at the assigned time and it is the responsibility of the player to arrive on time for the appointment. CANCELLATION MUST BE DONE 12 hours in advance or you lose your paid appointment. Private Training is designed to meet the specific needs of the player or team. New players will be first registering for a INDIVIDUAL SKILL EVALUATION to go through Coach Hoffman’s Skill Assessment. 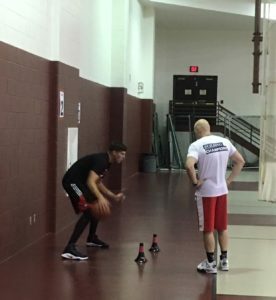 The Private Training Program is design to address the individual shooting technique for each player. Each session is 60 minutes in length and is broken up into 45 minutes of shooting/skill instruction followed by 15 minutes on the dr. dish shooting machine. Typically 4 Private Sessions are required to successfully completed the shooting progression for each player. After the Private Training program is complete the player will be put into a Personal Training Program which will allow the fastest growth possible for the individual. Nebraska High School players beginning Nov 15th will be required to choose the Private Training to abide by NSAA rules. Consists of high-level training catered to your specific team needs. Coach Hoffman has directed numerous practices for many select organizations from 1st-8th grade as well as high school boys and girls teams. Coach Hoffman will create team specific skills to help your team succeed. Sessions consist of individual skill development, offensive and defensive principles, and team strategies. Coach Hoffman has over 15 years of coaching and playing experience to take your select team to the next level. Typically teams consist from 7-10 players which makes the rate very reasonable for training. Teams may choose the length of practice with most practices lasting 75 minutes.